Coach's Corner - 2017-18 Philadelphia Eagles team signed/full size helmet, by 40+!!! 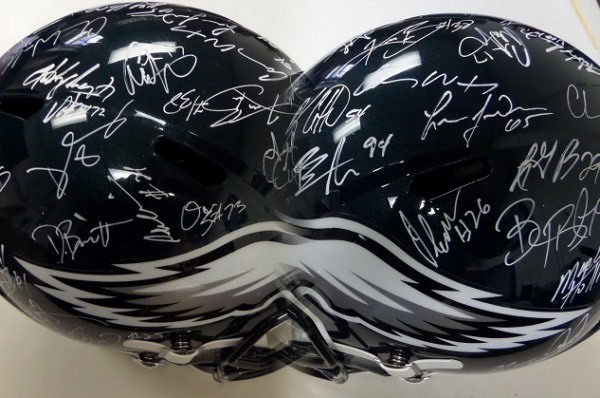 Go Back to Lot List 2017-18 Philadelphia Eagles team signed/full size helmet, by 40+!!! A TRUE Philly Special, this full size Eagles replica helmet from Riddell doesn't have a mark on it ... oh, unless you count the over 40 white paint pen autographs!!! All of the key players are on here, including Carson Wentz, Nick Foles, Brandon Graham, Fletcher Cox, Chris Long, Malcolm Jenkins, Jay Ajayi, Alshon Jeffrey, Zach Ertz, Nelson Agholor, Jason Kelce, and all the rest on this STUNNING collector's item that virtually has no limit on the retail circuit right now!